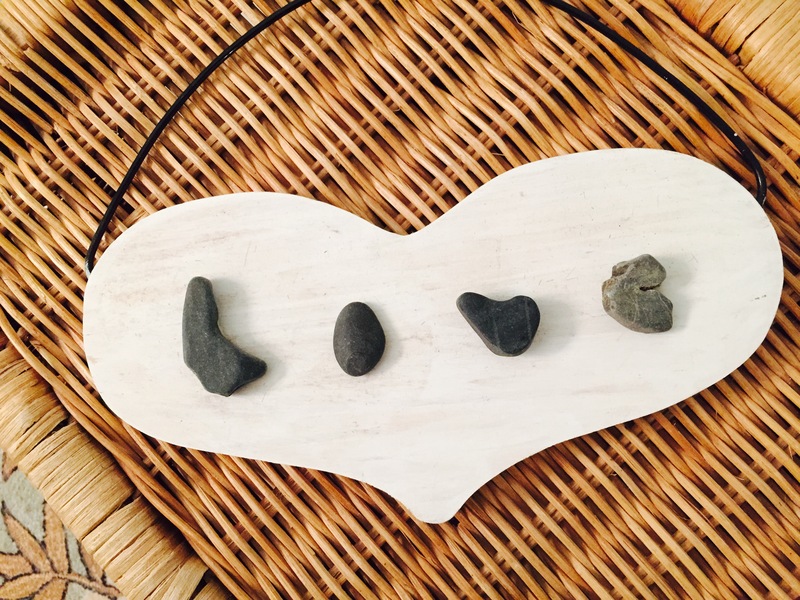 I found these rocks on a beach in Maine after George was diagnosed the first time with melanoma, over 10 years ago. I’m a perpetual navel gazer, in fact I do it so often that my bellybutton may take out a restraining order on me any day now. So I’ll take any excuse to reflect, like say, the beginning of a new year. I think back on the previous 12 months and wonder how we managed it all. I look over the pictures I posted on Facebook because, let’s be honest, that is now my photo album, and smile at the moments I shared with my friends and family. I take stock in what I have and whom I love, and I think about the parts of my life that I’d like to change. I also think about (especially over the last few years) the challenges I faced. Basically, I shake up the sand and see what comes loose. As much as I might like others to catch my attention, it’s always the big-boulder issues that jut out toward the top; the kind with jagged edges that leave psychological cuts and bruises. I know them well, their permanent scars show in my deepest insecurities and chronically bad habits. For years I got pretty good at dodging them; it wasn’t worth the pain of getting close. In my youth it was easier to turn my back on something painful in my life and pick one of the many visceral pleasures I knew would soothe my ache for the moment. But we all know what that gets you: 15 lbs., a monster Visa bill and a raging headache. Without facing my pain and expressing myself about it, all of my potential steppingstones remained barbed. As I grew older, and with the help of careers, kids and cancer, I realized that avoidance was no longer a luxury I could afford. To make a lasting change in my life I couldn’t simply sidestep these sharp stones, I had to grab them with both hands, turn them over, investigate them from every angle and suffer the scrapes. It was the only way to create a path through my pain rather than a detour. Ground down with honesty and reflection, smoothed with attention and familiarity, even the sharpest of edges became easy to touch. I could move and fit these rocks nicely together with other rounded ones from my past. Each painful experience honed and transformed to work together and create a foundation of emotional resilience. And with even more time those challenges, which once seemed huge and insurmountable, became manageable. The smaller pebbles of my history settled toward the bottom, filling in the cracks of my personal strength, shoring me up for the times when I felt like I might break. Those stones of losing an important job, or the letter from my editor telling me to start again combined to form the base; the grains of my 6th grade heartbreak and getting out-touched in butterfly when I was 10 provided the grout. At 43, I have come to the age when many of my contemporaries have begun experiencing tangible trauma, and irreplaceable loss. Some have lost parents, spouses and even children to illness and accidents. I see others providing long-term care to loved ones facing disease, at great cost to their own families. They are divorcing, deploying and depressed. Regardless of the circumstance, very few are escaping the damage that only true sorrow can bring. These are situations that, on a good day, cut so deep and so wide the word “cry” can’t do justice to the kinds of sounds and faces you make — the ones that would terrify your kids if they ever saw or heard you. Even as a writer, I have yet to find a word that accurately describes the head pounding, chest aching sobs that make your heart hurt and you feel in the pit of your stomach. My family and I have faced some hefty loss, too and it would be so easy to slide into anger, especially when it impacts the lives of children. I have often questioned what could possibly be the purpose of this much hurt for ones so young. But I refuse to accept that any pain we suffer is wasted, or that a tear we shed is in vain. Instead, I choose to believe that every challenge we face head-on isn’t just important, it is essential to our development as individuals to grow and succeed emotionally. It is by turning those stones and filling in the mortar that we establish our strength. Each time we suffer pain it is simply a building block in transit. I stand upright because I lost that job, suffered that heartbreak, and got out-touched in butterfly. Because all three of our children were admitted to the hospital before each was a year old. Because my dad died before he could read this. Because George used to have three brothers and now he has one. Because George got cancer and so did I. And because when I see my loved ones suffer my heart breaks. Those are some big, big rocks. But I keep picking them up, turning them over, getting cut, and figuring out why. And if I spend time working on them I soften the edges enough (I hope) not to get hurt by them again. Then I put them down next to the other weathered rocks to help make me strong. And I do it over and over, building up my footing. I have always felt that the greatest gift from God is perspective. Since pain can often be a breeding ground for myopia, a step up is a great tool to prevent me from getting stuck. With each stone under my feet my view gets bigger and better; I guess I can thank my struggles, in part, for that vista. I know I have much to experience, much to learn, but with each challenge the process gets simpler. And I know that all of my challenges have worth. I’m not done building, but it’s a start. Wishing you all a year of rounded rocks. Next > Is This Really What I Signed Up For? Incredible. At a loss for words. You continue to amaze me, Betsy. Just when I think I have seen the breadth of your talent, you produce a beautiful gem like this. So proud!